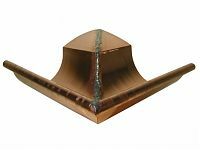 These half round highback miters are made to fit our half round highback gutters. Miters are installed on the outside of the gutter and are usually riveted and soldered together. Click here for our inside highback miters. Miters are available in 5”, 6”, 7” and 8” in both 16 and 20 oz. copper.